You can customize (or get rid of) the Windows Vista Sidebar. You customize the Sidebar so that you can be more productive. You close the Sidebar if it takes up too much real estate on your screen. The Vista Sidebar teems with gadgets, those little things that float around on your desktop and tell you the time, show pictures, convert money, or feed you the news. If the Sidebar isn’t visible, choose Start→All Programs→Accessories→Windows Sidebar. If the Sidebar is visible and you don’t like it, right-click a blank area inside the Sidebar and choose Exit. 1Right-click the Sidebar and choose Properties. Equivalently, choose Start→Control Panel→Appearance and Personalization, and then click the Windows Sidebar Properties icon. You see the Windows Sidebar Properties dialog box. 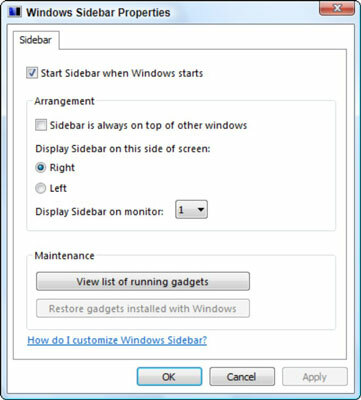 2Select the Start Sidebar When Windows Starts check box. You probably want to use the Sidebar (unless it’s been destabilizing your computer). 3Select the Sidebar Is Always on Top of Other Windows check box, and then click the Apply button. See whether you prefer having the Sidebar stay on top. If not, deselect the check box. 4Change the location of the Sidebar, if you wish, and when you’re happy with your settings, click the OK button.